Installing perm rods is by far one of my favorite styles for my natural hair. For starters, the style can last up to five days which cuts down on how often you have to manipulate your hair. Secondly, I haven’t met a woman who doesn’t look fabulous with a head full of curls! So how can you achieve a perfect perm rod set on natural hair every single time? Keep reading…there are 9 easy steps you must live by. Products respond well to clean hair and removing additional buildup will allow you to also achieve bouncy, voluminous curls once you have taken the perm rods out at the end. You can also opt to use a cleansing co-wash product if you do not need a full shampoo session. Starting a perm rod set on natural hair that is soaking wet will also allow you to have a great foundation for the curls to set. Once your hair is clean and conditioned next up are the styling products. My choice is to use a setting lotion for slight hold, a cream based product for moisture and softness and a little bit of oil to seal the moisture. Each product plays a different role in the process, but it’s totally up to you which products you want to use. Work your way through your hair with products section by section. Don’t try to apply the products all over at once. Navigating your hair section by section will allow you to ensure all product are evenly distributed throughout. For this style I’m using all the Creme of Nature for Natural Hair Argan Oil products because they have a leave in hair milk and foaming setting lotion that works well together. In total, I used the Creme of Nature Argan Oil Shine Foaming Mousse, the Creme of Nature Leave-In Butter Milk (actually used this as my leave in conditioner), and the Creme of Nature Butterlicious Hydrating Curl Creme. You can easily find these products at your nearest Sally’s. 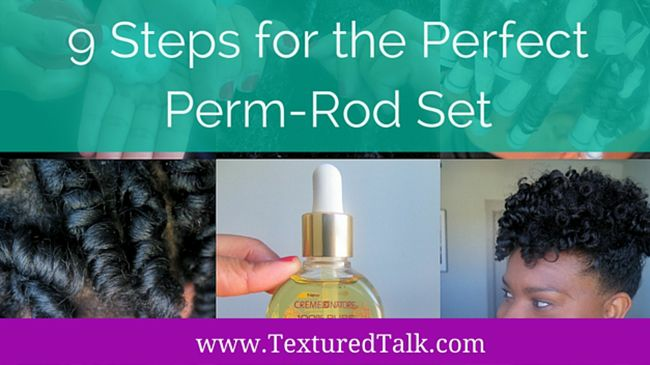 Use small sections for each perm rod set. Small sections will allow you to twirl your hair around the rod more effectively and help to ensure each section of hair is smooth along the rod. My rule of thumb is about an inch wide for each section. This also will help with your drying time later. For this installation I twisted the hair a few times at the root, then twirled the hair around the rod. Use extra products on the end of each perm rod section where your hair stops. The ends are the most important part. You want to make sure the hair doesn’t unravel so an extra pump of foaming lotion or dab of cream right here goes a long way. I can not stress this enough. Be aware of your schedule before installing perm rods to ensure you have plenty of time to allow your hair to dry. This WILL determine the success of your perm rod set. Hair that is still slightly damp will become frizzy as you unravel and the style will not last as long. Hooded dryer: Typical time for my hair to become 100% dry while sitting under the dryer is 2 hours. So cozy up with a good book and get comfortable! Remove hair from each perm rod first, before separating the curls. After you’ve removed each rod, search for areas where your hair could still be a little damp. If your hair is still a little wet, you can continue to dry while the hair still has the form of the curl for a few more minutes. Once you are 100% dry it’s time to separate. Once the hair is completely dry, separate with a light oil of your choice. If you love big hair, you might choose to separate 3 times for each section. If you want the style to last up to 5 days, I suggest separating 1-2 times and naturally allow the curls to separate further as the days pass. 9. Fluff, style and slay! Fluff your roots with a pick, style to your liking and slay!